Small collection bag (750 x 750 mm) for non-refillable glass packagings only (emblem “D”). Holder, i.e. a frame for attaching the large collection bags. If necessary, the retailer can get a holder from the EPP under a contract of use. Information plaque in Estonian and/or Russian language (except HoReCa). EPP has the right to change the quantities according to what the customer needs. The EPP accessories belong to the EPP and are intended for purposeful use only, i.e. 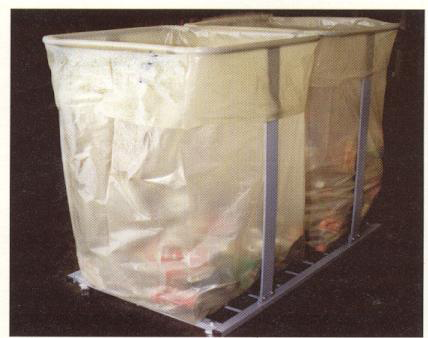 for collection of deposit-subjected packagings. It is strictly prohibited to use the accessories for any other purposes. The EPP monitors the customer balances of accessories via a real-time accounting system. This means that in case non-purposeful use or loss of accessories the EPP has the right to ask for a charge when replacement accessories are ordered.